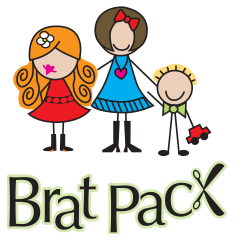 Brat Pack Salon offers quality kids haircuts for ages 0 and up. We offer adult services as well. We host fancy fun spa birthday parties, host ear piercing packages, and have lots of great temporary color options to brighten up your style! We have lots of toys for boys and girls of all ages. We carry a variety of organic hair products along with lice prevention, and swimmers shampoo. We have convenient parking and are open 7 day a week.